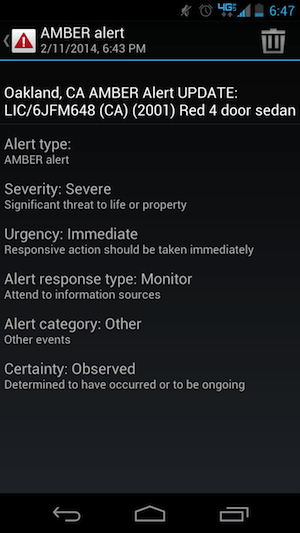 Amber Alert: Worse Than Nothing? In the last few years, there’s been a lot of discussion about alerts in the circles I move in. There’s general agreement that a lot of tools don’t provide good alerting mechanisms, including problems such as unclear alerts, alerts that can’t be acted upon, and alerts that lack context. I’ve seen alerts like this before, but they were alerts about severe weather events, such as tornado watches. This one, frankly, looked like someone hacked into the Verizon network and sent out spam alarms. Seriously—what the hell, a license plate? What? Besides, it says AMBER, which is a cautionary color. It’s not a red alert, after all. It can’t be anything serious, right? This is even less informative. 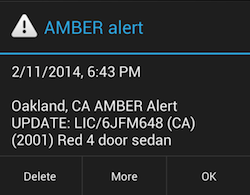 It’s an amber alert (not an urgent color like red). But it’s a sigificant threat to my life or property? I’m supposed to respond to it immediately? Oh wait, my response is to “monitor” and “attend to information sources.” Almost everything on this whole screen is conflicting. What a cluster-fudge of useless non-information! Later I looked up some information online and found that an amber alert is a child abduction alert. This one turned out to be a false alarm. All of this raises an obvious question: why on earth would someone think that making a bunch of people’s cellphones quack with a cryptic message would convey useful information? For something as critical as a child abduction, they should get to the point and state it directly. Judging by reactions around me, and people I spoke to, almost nobody knows what an amber alert is. I certainly didn’t. When I tweeted about it, only one person in my network seemed to be aware of it. How can anyone take something like this seriously? All this does is make people like me find the preferences for alerts and disable them. But then I remember: oh, yeah. Pingdom alerts (we’ll email you that your site is down, but we won’t tell you an HTTP status code or anything else remotely useful.) Nagios alerts (we’ll tell you DISK CRITICAL and follow that with (44% inode=97%)—anyone know what that means?). And so on. Perhaps the amber alert system was designed by a system administrator, not a politician.